After 14 and 15 years respectively, Dennis Stokhaug and Jim Ardis are leaving their shared position as Operations Managers for the Gathering. Jim will stay on as Dinner Coordinator, and both have offered to train the new person when hired. It’s difficult wrapping one’s brain around the thought of their impending departures. In 2000, Jim Ardis began working with the Gathering as our full time Operations Manager, responsible for the purchase, storage and transport of food, and oversight of equipment and facility maintenance and repairs at all Gathering Sites. A year later, Dennis Stokhaug took on that role while Jim concentrated on the Dinner Program. And five years after that, they began sharing the Operations Manager duties. It’s a tough job: early hours, lots of driving, keeping your cool, schmoozing with donors of food and supplies, making sense out of inventory lists, locating the best deal on an item, responding to a multitude of “bosses”, heavy lifting, and stairs, stairs, stairs! What could possibly keep each of them committed to this work for so many years? 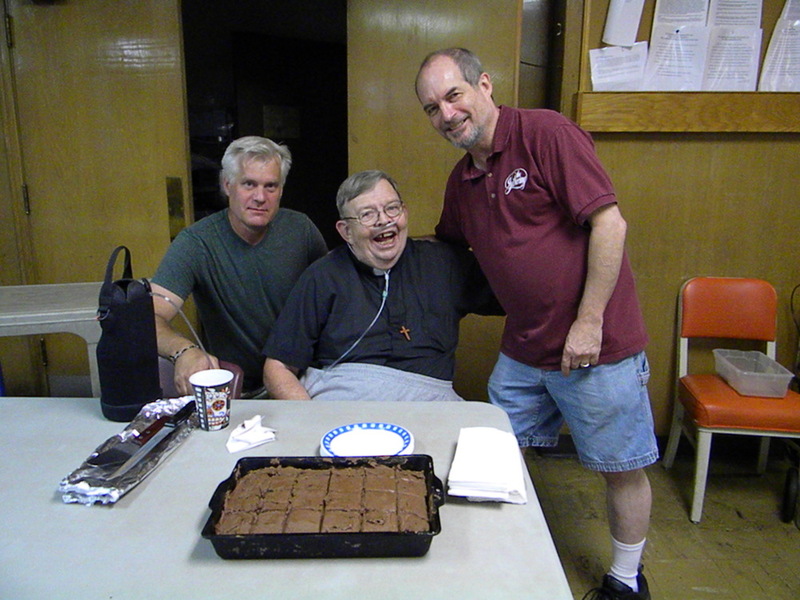 We will all miss you, Dennis, for your calm demeanor, your thankfulness, your respect for our guests. And Jim, even though you will still be around with the Dinner Program, we will miss your diehard belief that organizations and programs and the Gathering can always be better. One of the most beautiful things about community is that it opens people up to making real connections, building deep bonds and intentionally appreciating another person for who they are. This intentionality, however, can make saying “goodbye” all the more difficult. At the end of September, the Gathering will say goodbye to George Neureuther, who has been a cornerstone in our community for eight years. George began working full time with the Gathering eight years ago as the Volunteer Manager and Breakfast Coordinator. He then transitioned into a part time role as the Breakfast Coordinator and began working with Interchange Food Pantry as well. At the end of September 2014, George will be working full time as Interchange Food Pantry’s Executive Director. He will be sorely missed. When asked to share one of his most memorable experiences with the Gathering’s breakfast program, George explained one rather peculiar and special connection with a guest by the name of Eddy. Breakfast program guests and volunteers alike have vocalized how much they will miss George and thanked him for all of his hard work. It is clear that George has truly left an impact on the Gathering’s breakfast program and community. Although this may be a goodbye, we know that this is just another chapter of kindness and compassion for George and we look forward to seeing where his passion will take him next. In the meantime, we will miss our usual suspect.